This calculated performance sheet was prepeared 8 months after the release of the previous datasheet containing flight tested values in November 1941 (IV/43/42). Both datasets are undertood for 30-minute power settings (Steig und Kampfleistung) of the DB 601 E engine, ie. 1.3ata manifold pressure and 2500 rpm, or about 1200 PS (static) output at Sea Level. The performance data contained the calculated Datenblatt shown on this page is far more conservative than stated in the predating flight tested datasheet - as seen in the comparison table below. It is noticable that while the associated horsepower and the level speed results at Sea Level are practically identical, the two datasets show increasing seperation as altitude increases. Considering the aformentioned charasteristics observations of the two sets of data, and that most other Bf 109F-4 performance sheets and grahps repeatadly claim the 635 km/h value at the same power setting in agreement with the IV/78/42 calculated datasheet, it seems likely that the flight tested datasheet IV/43/42 is without compressibilty correction - the lack of such correction would characteristically result in increasingly higher instrument reading error with the increase of altitude, the read error levels peaking out at maximum speed at the rated altitude. 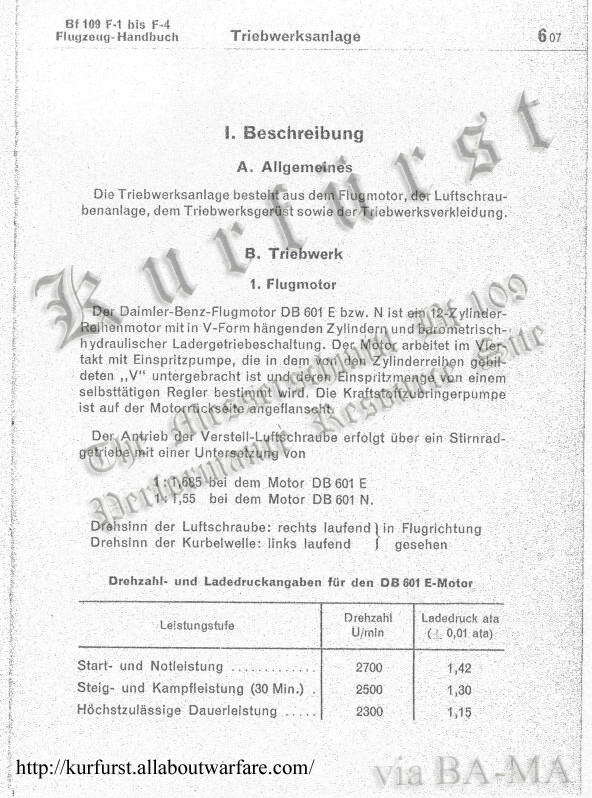 Another noteworthy point of interest is that this more recent calculated datasheet, reproduced below, dating from July 1942 no longer notes the banning of the Start und Notleistungs power for the DB 601 E engine as opposed to the previous datasheet from the end of November 1941, points to that the full power has been cleared for the engine. This clearance is in fact also supported by the February 1942 release of the Bf 109F Flugzeughandbuch, which no longer notes any limitation in regards to the DB 601 E. The new Hanbuch part 7 (Powerplant) was likely to have been re-issued because of this clearance. See D.(Luft) T. 2109F-1 bis F-4, 'Bf 109F-1 bis F-4 Flugzeug-Handbuch', Teil 6 'Triebwerksanlage', page 7., authorized in Berlin, 24 February 1942. 625 km/h at 10 000 m.
Rechlin's figures appear to have been corrected for compressibilty, ie. compare the 10 km level speeds between Rechlin and IV/78/42 calculated datasheet which are in reasonable agreement. Zelle: ohne Zusatzanbauten wie Bo-Schlösser usw. Zusätzliche Hutzen für Zündkerzen u. Verdichterbelüftung..
flugstellung schon ca 2500 - 3000 m über VH erreicht). Flugdauer: Es wurden die Abzüge für Warmlaufen usw. entspr. entspr. den Angaben der Motormappe - Toleranz angesetzt. Last updated 1 December 2006.